As part of an investigation the RIAA has filed a declaration at a federal court in California to obtain the personal details of one of YouTube's users. Through the legal action against YouTube, the RIAA hopes to find out more about the person who uploaded a recording of Britney Spears' concert at the MGM Grand in Las Vegas a few weeks ago. The RIAA has launched an investigation into a high-quality recording of a Britney Spears concert that was uploaded to YouTube last month. 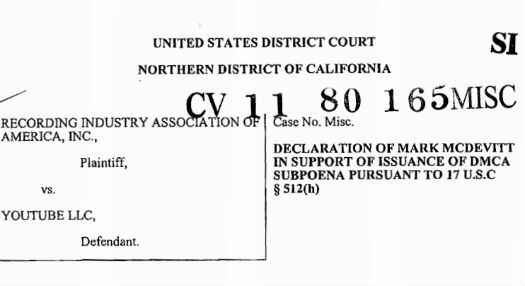 As part of the investigation the music industry group has requested a subpoena against YouTube. Although it’s quite common for the major music labels to send takedown requests to YouTube, as far as we’re aware this is the first time the RIAA has filed legal action against the video hosting site in order to obtain the personal details of an uploader. In a declaration to the court the RIAA’s Vice President of Online Piracy, Mark McDevitt, requests a subpoena ordering YouTube to reveal the IP-address, email address, and any other information that may be used to identify the person who uploaded the concert. TorrentFreak asked the RIAA for a response but their spokesman declined to comment on the case. The video in question has since been removed from YouTube but copies of the full concert can still be found elsewhere on the video site. Although YouTube is listed as a defendant in the court documents, this doesn’t mean YouTube is being held liable for copyright infringement. The filing is for a so-called DMCA subpoena which the RIAA occasionally files as part of ongoing investigations into more ‘severe’ acts of copyright infringement. The court docket shows that the RIAA filed the legal action against YouTube last month, and that the case was closed after a week. A copyright lawyer informed TorrentFreak that this most likely means that the subpoena was granted by the court and that YouTube agreed to hand over the personal details that were requested. Earlier this year the RIAA filed a similar declaration at a federal court in California, where it requested a subpoena to obtain the personal details of several Box.net users. These individuals were allegedly storing pre-release music on their accounts. Box.net said at the time that they would hand over the requested details if the subpoena was granted. “We take the confidentiality of our customers’ information very seriously, but just like all other businesses, we are legally required to comply with court orders,” the company told THR. Thus far we are not aware of any lawsuits that have appeared as a result of the RIAA’s efforts to track down these alleged copyright infringers. In 2008 the RIAA announced that it would no longer start mass-lawsuits against alleged copyright infringers using P2P networks. However, they reserved the right to go after individuals who leak unreleased content.